Officer: "Milligan? What are you standing there for? Milligan: "Everybody's got to be somewhere sir". Spike Milligan, Adolf Hitler: My Part in his Downfall (First of five war memoirs). Also used in one of the Goon Show scripts with Bluebottle and Eccles. "Everybody's got to be somewhere" was brought home to me again this week, with the Nottingham Post running a series of daily articles on the effects of the County and City cuts on the most vulnerable in our society. I've mentioned before that social welfare is my passion, as it has occupied me in most of my working life. 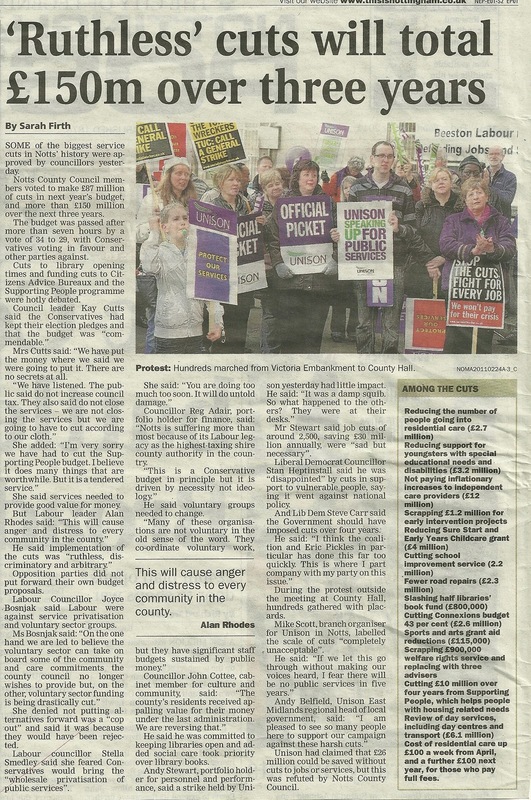 This was the headline the day after Nottinghamshire County Council approved its budget proposals on the 24th February. The City Council, though their budget plans await approval at their meeting next Monday, have already informed some groups of the decision to de-commission their services. My purpose here is not to look at the budget figures, or to look at individual organisations affected, but to take a broad look at the overall impact of decisions made, and the possible, some would say probable consequences. Before proceeding, I should say that in my view, the Coalition Government have reacted in panic when faced with the budget deficit. The scale and timing of the cuts to local authorities has been draconian, and some of these local authorities have reacted in similar ways. Millions slashed from budgets over three years is too much to cope with, and the Voluntary and Community Sector may never recover. This is at a time when the Prime Minister is looking for the Sector to play an important role in his ideas for The Big Society. You cannot slash peoples' budgets, which affects their ability to provide services, then say to those same people, "Come and help me". It just won't work. Advice services in the County and City are having their grants dramatically cut from April. These services have a long and proud record of helping their communities out of debt, and to deal with the threat of losing their homes. Jobs will go, volunteering opportunities will diminish, centres will close or be forced to provide a much reduced service. The Citizens Advice Bureau manager at Broxtowe says in relation to the cuts, "The only thing that isn't going down is the demand - it's getting worse, just where these people will go I'm not sure". 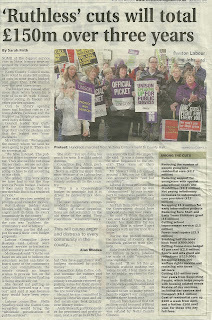 This is confirmed by the Chief Executive of Ashfield CAB, "We will not be able to meet demand. Demand is already there - we've got four-week waiting lists for specialist debt advice, and we've got queues down the street every day". They are right to be asking just where will these people go, for "Everybody's got to be somewhere". Homeless people are not part of a homogeneous group. They are not all the same, and rarely do they present with single issues. 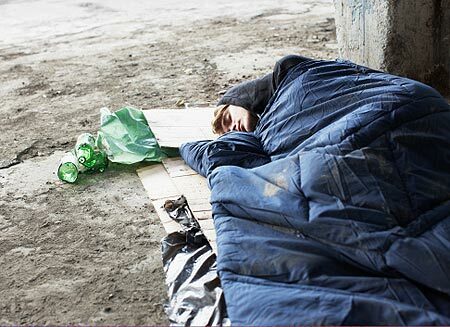 Along with the lack of accommodation, there can be drug and alcohol matters, mental health issues, behavioural difficulties and criminal activities. Homeless people tend to have two or more of the above issues in their lives which require specialist, and at times intensive support. The County and City Council's are withdrawing financial support from a number of homeless hostels, day centres and other support services. Four of the homeless hostels under threat in Nottingham, last year housed 387 people. Day Centres under threat each see up to 100 people a day. A centre in Nottingham for people with drug and alcohol problems sees up to 84 people a day. Where are these people to go? For, "Everybody's got to be somewhere". So, hostels are closing; day centres are closing, which as a bare minimum provide "a place to be", and other support services are either closing or reducing the services on offer. Where will people go? We agree by now don't we that "Everybody's got to be somewhere", so it doesn't need a crystal ball to see that for many, with no other options open to them, they will end up on the streets of our Cities and Towns. I'm really trying hard not to be a doom monger, but I'm also trying to be realistic. Rough sleeping on the streets will increase; people will die; anti-social behaviour will rise, as will criminal activity. The cost to the public purse will be huge. And in case you think that I'm over-reacting here, let me show you that I am not alone in my thinking. The Operations Director at the large charity Framework says about these cuts and closures, "It will have a huge, damaging impact on the city. People will die and, significantly, people will die early as a result of this". He warned that it would also impact on communities as drug-related crime and anti-social behaviour could also increase. These are the consequences that I see of the decisions taken on funding, and of the closure of vital services. Take away places from people, but "Everybody's got to be somewhere". Finally, let me give you a warning of something else that the future might hold in store, for where one Council goes, others inevitably follow. One of the richest Councils in the land, Westminster Council have produced a consultation paper that says rough sleeping and soup runs would be banned in the Westminster Cathedral Piazza and surrounding area. This is at a time when the Council are slashing £5 million of funding to three homeless hostels in the Borough. They wish to criminalise the unfortunates who are homeless, and to make it an offence to "give out food for free", punishable by fines. In a statement that defies description, one of the lead Councillors said that free food "keeps people on the streets longer, and actually encourages people to sleep rough". In all my years of working with homeless people, I have come across very few where sleeping on the streets was a life choice. The vast majority wanted to live in a home of their own. By and large, people will not live on the streets because at some time of the day or night they are going to get soup and a roll. So, if you have nowhere to live you will be punished, and if you want to help those who have nowhere to live, you will be punished. Please Nottingham, do not follow in the footsteps of heartless Westminster. If you feel tempted to ask someone sleeping on the streets of any of our Towns or Cities why they are there, do not be surprised if they come back at you with, "Everybody's got to be somewhere".